What is a RAP Number™? 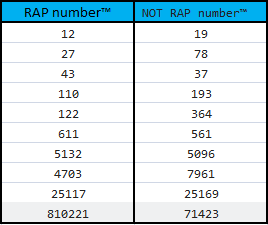 Taking inspiration from "What is the word™" series, here the numbers conforms to a special rule, I call it a RAP number™. Use the following examples below to find the rule. Note : This is my first crack at this type of puzzle, so suggestions and edits are welcome. Note : You can differentiate any number into these categories. This "Rule" can be applied to each and every number existed. I am thinking about the way to give hint without spoiling the answer. The description below needs to call the 0 digit the ten(s) digit - if acceptable? And all the non-RAP words' digits are not in alphabetical order. What is a Shy Word™? What is a Chaotic Word™? What is a Lonely Word™? What is a Devilish Phrase™/Word™? What is a Confused Word™? What is a Japanese Word™? What is a Self-Rejecting Number™? What is a Rotatable Number™?